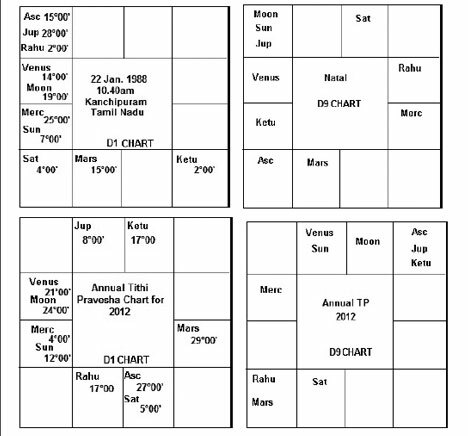 Annual Tithi Pravesha (TP) chart is cast every year, when Moon is exactly at the same angle from Sun as at birth, in the same soli-lunar month as at birth. Tithi Pravesha Chart is the horoscope drawn for the birth moment of the exact (natal) Tithi or the distance between the Sun and Moon is repeated as at birth, when the Sun is in the natal Sun sign. A chart is drawn for this moment, for the latitude and longitude for the birth place, as in the natal chart. Lord of the Hora at the time of the TP chart and the respective Week-Day Lord give indications about major events to take place in that year. THE most frequently asked question by many young people is “When will I get married”. This question can be answered through Hora Lord of Annual Tithi Pravesha Chart of a particular year. Now a days, many youngsters know basic Astrology through Social medias such as Face Book, Twitter, various websites, books, etc. The boy and the girl assess compatibility of their birth charts by the Astro- Softwares by themselves, if the marriage-proposal comes under “arranged marriage” category. To determine the timing of marriage, many parameters are given in classics. Renouwned astrologers have also given guidance, out of their experience. For timing of marriage, it is first necessary to ascertain the approximate age-group category, in which marriage may take place. 5. Denial of Marriage - 34 years & beyond. 1. In B.P.H.S. Chapter 18 Sl. 22 to 34, “Time of Marriage” has been discussed by the Sage. 2. In Sri Sarvartha Chinthamani, early marriage has been elaborated in Stanzas 753 to 755. 6. Combination of Venus and Mars in the 7th house. 8. Benefics not in retrogression. family, benefics in 4/10 axis promise wealth, as 4th house represents House of happiness). 5. Placement of Full Moon in the 5th or 7th. 9. Venus and Lagna lord in lagna Kendras or Trikonas. 4. Venus occupying Mars or Saturn Navamsa. 1. Saturn and Mars in Lagna or 7th house, or their influence on Lagna lord or 7th lord. 3. 7th house or 7th lord afflicted by malefic, without any benefic aspect. 2. Venus debilitated in both Rasi & Navamsa. 3. Lagna or 7th house and their lords in Fixed signs & Moon in Moveable sign. 4. Venus combust, debilitated and in Papakartari Yoga. 5. Malefic in Lagna, 7th &12th house, with waning Moon in the 5th house. 6. 2nd or 7th house afflicted and their lords posited in Fixed signs. 7. Lagna lord, 7th lord and Venus posited in Saturn Navamsa. 8. Natural Karaka for marriage, namely, Venus, Moon & Rahu are all highly afflicted. 9. Lagna lord combined with 7th lord in the 6th ,8th or 12th house. 10.7th house from Lagna and 7th house from Moon, not aspected by benefic. The above few combinations are general and should not be taken as conclusive. We have to take into consideration other factors, such as, Shadbala, Avasthas, Yogas operating at that time and dispositors of karaka planets. For example, a debilitated Saturn may push the category up from delayed to late marriage and an exalted Saturn may bring down the category from late to delayed marriage, etc. 2. Navamsa Lagna lord in Trikona: slight delay, but will get married in time. 3. Navamsa Lagna lord in Dusthana, spoilt by malefic like Saturn, Mars, Sun, Rahu and Ketu: Marriage beyond 30 years. 4. Navamsa Lagna lord is extremely spoilt: Denial of marriage. 5. Navamsa Lagna Lord in 7th house, 7th lord in 12th house: marriage in 23rd or 26th years of age. 6. Lord of 8th house of Rasi chart is in the 7th house of Navamsa and Venus in Navamsa lagna: marriage in 25th or 33rd years of age. 7. If Venus in the seventh house or the Seventh Lord or the Lagna Lord of Navamsa, all afflicted: denial of marriage. According to Shri K.N.Rao, about 60 to 70 percentage of marriages happen in the Dasha/Antar Dasa (concentrate mere on Antar dasa) of the lords of 1, 5, and 7 of D1, D9 and D7 charts of the native. 1. Dasa of Rahu and Venus. 2. Dasa of 7th lord or planets with or aspecting the 7th house or 7th lord. 1. Add Longitude of Lagna lord and 7th lord. When Jupiter transits this point / its trine/7th from it, marriage will happen. 2. Add Longitudes of birth star lord and 7th lord. When Jupiter transits this point or its trine, marriage is likely to be fixed. 3. Jupiter transiting or aspecting the Rasi occupied by Navamsa dispositor of Lagna lord. 4. Lagna lord transiting across the 7th house. 5. Male gets married, when Jupiter transits natal Venus or its dispositor or their trines. 6. Female gets married, when Venus transits natal Mars or its dispositor or their trines. 7. Astakavarga system gives many transits indicating marriage. 8. Dasa of 2nd and 7th lord, if they aspect lagna; and Lagna lord aspecting Jupiter in 7th house. 9. When Jupiter transits the house, where Sun is in Navamsa. 10. When Jupiter transits over Navamsa Lagna lord. 11. Navamsa sign of Lagna lord is aspected by transit Jupiter or Moon. 12. Navamsa sign of Lagna lord is transited by Lagna lord or 7th lord. Sri K.N. Rao, who have formulated a theory that marriage can be predicted using the transit of two important planets namely, Saturn and Jupiter, supplemented by transits of Mars and Moon to narrow down the timing of marriage. It is certain that without the blessings of Jupiter and Saturn, no good thing would take place in one’s life. 1. Transit Jupiter should aspect 7th lord and / or lagna. 2. Transit Saturn should aspect lagna lord and / or 7th house. These conditions may repeat more than one time in the native’s life time. The age of the native should be taken into consideration, with reference to the Dasa & Bhukti running at that time. If they are at variance, then Dasa & Bhukti prediction will prevail. Strong connection between 5th lord, 7th lord & 9th lord, either by conjunction or aspects may result in love marriage. Rahu’s involvement with lagna or 7th house indicates inter-caste marriage. 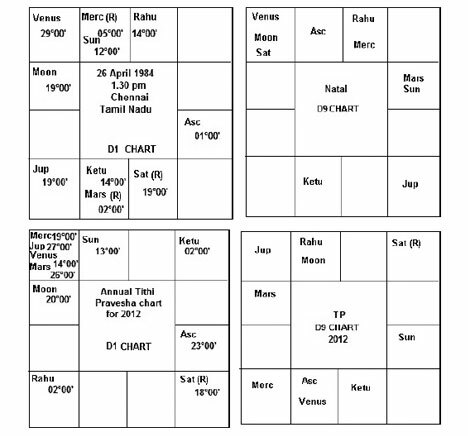 Tithi Pravesha Chart is the horoscope drawn for the birth moment of the exact (natal) Tithi or the distance between the Sun and Moon is repeated as at birth, when the Sun is in the natal Sun sign. A chart is drawn for this moment, for the latitude and longitude for the birth place, as in the natal chart. Tithi denotes the element of water(Jala) and therefore shows connections, social events, the flow of things, love, romance, marriage, feeling, wealth, comforts and money. Therefore many of the good things, which are going to happen in a particular year, can be studied from the Annual Tithi Pravesha Chart. Annual Tithi Pravesha chart is studied through Mahadasas in the Ashtottari Dasa scheme, which is for one year, which is divided for 8 planets (except Ketu). Ketu does not have a Dasa assigned in Ashtottari Dasa system. Major events in a particular year can be studied from the Week day Lord & Hora Lord in Annual Tithi Pravesha chart. Hora Lord’s yoga (association) with the 7th house or lord can give marriage in that year. This should be applied both in Rasi and Navamsa chart. If it is satisfied, then the Dasa Bhukti can be verified. Tithi Ashtottari Dasa of 7th lord or Hora Lord, or the planets having yoga with 7th lord and Hora Lord will confer the marriage within that year. (The Hora Lord at the commencement of the Tithi in the given year. The events can be seen from the ownership, placement and yogas of the Hora Lord in the Tithi Pravesh chart). “Tithi Pravesha Chakra” is described by Pt.Sanjay Rath and Shri P.V.R.Narasimha Rao in their website. “Jagannatha Hora” Sotware has been used to prepare charts for case studies. The native was 24 years, in Jan.2012. Let us study the prospects of that year, with regard to marriage. From the above, we can ascertain that the Annual TP chart is drawn for the exact entry of the Tithi in 2012. Hora Lord for Annual TP is Mercury and Week day is Thursday (Week Day-lord is Jupiter). The native got married on 19 Feb. 2012 in Mercury (Hora Lord for Annual TP chart) Maha Dasa of Tithi Ashtottari Dasa. 2. Mercury is Lagna lord for D9 of Annual TP. 4. Mercury is 7th lord in D1 natal chart. 5. On 19 Feb. 2012, Jupiter transits the 2nd (Aries) house of D1 in natal chart; 5th in D9 of natal chart; 7th in Annual TP chart; 11th in D9 of Annual TP chart. 6. Saturn aspects transit Jupiter and natal Jupiter in D1 of Annual TP chart. (transit Jupiter travels (Aries) on natal Jupiter in D1 of Annual TP chart). 1. Sun, the Lagna lord of both Annual TP and natal chart, is exalted; 2nd lord is Mercury of D9 (natal) chart. 2. Sun in own sign in D9 of Annual TP. 3.Jupiter in own house in D1 of natal chart; D1 and D9 of Annual TP charts. It may also be noted that on the date of marriage i.e 18 Feb. 2012 - Jupiter was transiting (Aries) on Lagna Lord both in natal chart and Annual TP chart and D9 Lagna of natal chart; 9th house in D1 of both charts. Transit Saturn was aspecting transit Jupiter on the date of marriage. The native got married on 18 Feb. 2012 in Sun Maha Dasa of Ashtottari system. Saturn (7th lord) Maha Dasa and Sun Bhukthi in Vimsottari Dasa of Natal chart. In both the Case-studies, marriage was solemnized during Ashtottari mahadasa of Hora Lord.